Like the outcome of the rematch in Rocky II, Creed is an unlikely triumph. 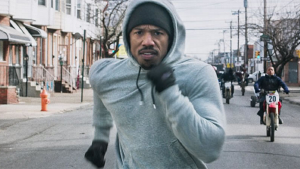 And unlike most of the entries in the punch-drunk franchise (with the exception of the triple Oscar-winning original) it’s surprisingly credible, peppering its montages with hard-hitting themes like privilege, aging and absent father figures, anchored by powerful central performances from Michael B. Jordan and Sylvester Stallone. Not to mention the odd blast of thumping hip-hop.